He was a truly beautiful old bird, and completely unique to me in that he carried four spurs and three beards. It had been a beautiful April morning by turkey hunting standards, crystal clear and windless, and brisk to the point of seeing your breath early on; one of those mornings when sound seems to travel forever and makes a turkey call seem as loud as a trumpet, no matter how softly you play it. I'd been trumpeting away at the same bird for more than three hours, and with it nearing ten o'clock, I looked along the edge of the ridge line he'd been circling and out steps . . . a hen . . . and then another . . . and another, scratching along in my direction without a care in the world. Then shortly I see him round the corner, fully fanned out and puffed up like a mad fighting chicken, wings dragging and spittin' as he came. The hens filed past one after the other, side-eyeing me and not liking what they were seeing. Just as they were about to break and flush, I cut loose on the old Tom with a load of number fives and it was done. It was the second week of April and by now this bird and I were old friends. I felt a tinge of regret for doing him that way, but hefting him, jeweled in the light, I was glad to finally meet him face to face. He was a truly beautiful old bird, and completely unique to me in that he carried four spurs and three beards. He'd been scratching and fighting for so long that his toes were nubbed off and nail-less - a tough "old man" who'd seen a long life and who remains to this day, twenty-five years later, the biggest gobbler I have ever seen. I had a long walk back to the truck, and I must have stopped and re-arranged him from one shoulder to the other about ten times before I stepped clear of the swamp and out onto a road. When I cleared the timber I stopped to rest awhile before walking the next mile or so to my vehicle and was sitting on the edge of the road inspecting the old turkey. I had his tail and wings spread out and was examining the spurs and beards when I heard a rattle down the road and looked to see an old blue Ford bouncing around the bend. The driver was an aged fellow who surely had seen seventy come and go. A grizzled five o'clock shadow and a shot of white curly hair unfurled from under his hat. He had a kind face and a twinkle in his eyes, and he sat there at the wheel looking down at me with an amused expression on his face. Finally he said, "You carry him or drag him out?" I looked up at him and laughed and wiped some sweat from my brow. "Shoulda dragged him!" I said. "He 'bout wore you out looks to me!" "I don't know who's killed who," I said. "I still have better than a mile back to the truck." "Ah hell, we can fix that. You mind if I look at him?" He parked the truck and came limping towards me with an arthritic gate. He reached with one hand and grabbed the bird by a leg to heft him, then reached and grabbed the other leg. He held him up by both legs then, sort of wobbly armed. "Gawd almighty! He's heavier than a sack a feed!" "Can you believe it?" I said. The old man shook his head. "I didn't know they made 'em that big around here." He laid the old bird back down and re-arranged his feathers respectfully, looked at me and said, "How 'bout we weigh 'im," and without waiting for an answer limped back to the truck and went to rooting around in a tool box and came back with a cotton scale. He tapped on it with a finger, hard enough to knock some grit out of it. "I reckon it's still true, true enough anyways," he said. I wrapped a cord around one of the gobbler's legs and hooked it to the scale and we both held it up so the bird could clear the ground. The old man squinted at the needle through some near Coke-bottle glasses. "Looks like twenty-five pounds," he said. Then he turned it to me and it read the same to my eye. "That old scale might be off some, but it ain't by much. That's one helluva gobbler there; no matter where ya come from!" the old man said. After that we introduced ourselves and he went and dropped the tail gate of the truck and we laid the old bird there and sat talking on either side of him for awhile, the old man constantly stroking the gobbler's feathers and beards, and turning his legs to look at the long doubled spurs, the top ones rounded from age and the bottom ones both sharp as needles. The primary beard was well over twelve inches, and two more jake-like beards protruded in descending lengths above it. "I reckon he was so old he figured he needed some back up," the old man said. I just shook my head, because I didn't know what to say about it all. Then I did say, "We are downstream of the bomb plant." He laughed. "A nuclear turkey!" We both smiled and shrugged at that one. He looked at my gun then, where it was laying up against a root ball. "Nice old model 12," he said. 'Twenty gauge?" I nodded and he went to the cab of the truck, lifted the seat and came back and handed me his gun. It was a Fox Sterlingworth and a twenty gauge as well. I breeched it and looked down the tubes, then snapped it shut and put it to my shoulder. It was perfectly balanced and dropped quick to the eye, like all Fox doubles. A fine piece of equipment and lovingly tended to. "That's all you need for them things," he said, nodding at the turkey. "Might as well be huntin' after elephants with them three-and-a-half-inch hand cannons folks shoot these days." Then he reached into his coat pocket and produced a box call that he had obviously whittled himself. It was cypress and light as a feather, but darkly oiled and chipped in places by countless seasons of handling. He motioned I should play it and I did. It rang out beautifully and true as any hen out there and I allowed as it was a fine one, which it surely was. When I handed it back he held onto it tenderly. "You know," he said, "I've taught many a hunter how to call a turkey, but I've got to be the worst turkey hunter that ever lived. I hear 'bout these guys that go out yonder and roost 'em and then the next morning fore it's good daylight even, they are done headed home with the turkey." He shook his head. "That never happens to me. Seems like I got to chase 'em all over hell and back before they take any mercy on me at all!" He looked off into nowhere, like he was figuring on something. "I don't believe I've killed more than a handful before nine o'clock or so and most of the time it's near eleven or better." "I shot this bird right at ten," I said. "I'm the same way, I hardly ever kill one right off the tree and when I do I just figure it's luck more than anything else." "Me neither," he said. "Just cause you know what tree they's in, don't mean you know which way they'll be flying out of it!" I shook my head at the truth of that one. 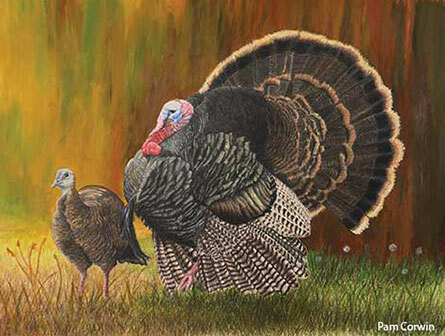 "Them gobblers know exactly where they's going and why they's going there." He scratched at his grizzled old chin. "I always figured it best to let 'em get where they wanna be, stead of trying to tell 'em different. You can't tell 'em nothin' anyway; they're hard-headed you know?" He grinned. "Ain't that the truth! Last year I called one round and round the edge of a little ole flat that weren't forty yards wide and there he is no more'n sixty yards away, hollerin' at everything I said, but did he come across there to me? Nope. I had to let him walk off and then sneak over there." He laughed to himself. "I might of yelped twice and looked up and here he comes trottin' back!" 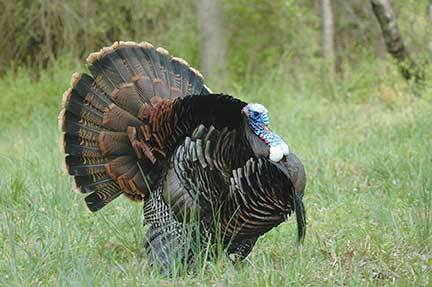 He feigned raising his gun and taking aim at the gobbler. "When he sees me raise the gun up, he stops and stretches his old neck out long and high, like to say, 'who's that over yonder?' And I say to myself, 'you finicky ole so-and-so, I'm gettin' ready to show you who it is!' He was a good un for sure, but nothing like that one there." "You ever see one like this before?" "Not more than a couple a times and I been at this close to sixty years." He reached and patted the old bird one last time and said, "Those there don't just walk up on accident. You got to hunt 'em!" As we bumped along towards my truck I looked his cab over. It smelled of cigar smoke and cordite. 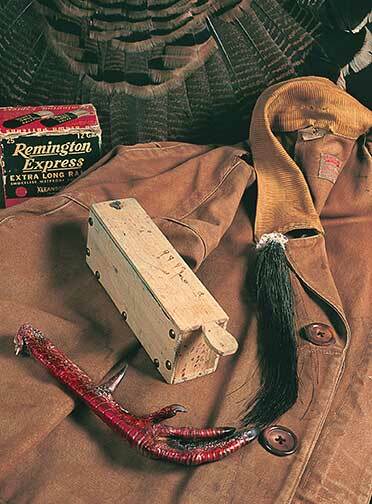 There were a couple of long "paint brush" turkey beards and a pair of well curved spurs hung on a leather over the stick shift that looked to have been there awhile. They obviously meant something to him, as did all the rest of his trappings, laid out in what looked to be particular order. Old gloves and masks and various shirts and jackets, and all of them well worn, like the clothes on his back. There were some old Peters twenty-gauge high brass number sixes rattling around in a tattered box on the seat between us and a couple of spent casings in the ash tray. Nothing in that truck looked to have been purchased after about 1980, except for the Swisher Sweets cigars in his breast pocket and a bag of Levi Garrett chewing tobacco shoved down in the seat cushions. When we stepped out of the truck to shake hands in parting, he studied me for a long second. My old gun, briar tattered and knee worn pants legs, the leather on my boots thinned from the brush. He smiled then and said, "It's been good talking with ya son! There's not too many of us left out here." As he drove away he stopped and stuck his head out the window and hollered back, "You ever see my truck parked around here, don't be afraid to stop off and hoot me up!" With that, he raised a hand in parting and drove off, looking back at me in the rearview mirror, standing with the bird slung over my shoulder. It was a wistful and longing gaze, as if he saw something of himself mirrored in my image, something he'd long left behind. A young hunter standing proudly with an old turkey, who, if fate and destiny would have it, would one day simply be another old turkey hunter himself. A quarter of a century has passed since that exchange, and I never met up with that old man again. But every now and then I catch a glimpse of him in my own mirror - ashen hair, time-haggered and limping stride - and sometimes in the brighter eyes of eager youths afield. And in those reflections I see a legacy kept alive, a sporting heritage that should never fade from sight. A. 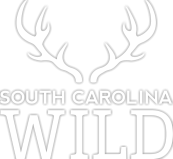 Hunter Smith is an eighteenth generation South Carolinian and professional hunting guide. His book, Stories from a Life Afield, will be published by USC press in 2014. 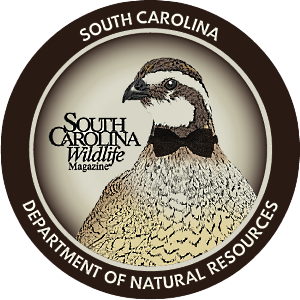 Pam Corwin finds lots of inspiration for her artwork while on the job as a S.C. Department of Natural Resources biologist. For more information on her artwork please email her.